April was not a successful month for me, sewing-wise. The main reason being that I got sick and that kept me from sewing for pretty much the entire second half of the month. Orange is April's color for the Rainbow Scrap Challenge. There is a (small) pile of orange scraps sitting on my cutting table, but that's as far as I got. I'm planning to do April and May butterflies at the same time so that I can catch up. My OMG for April was to complete steps 1 & 2 of the Scrap Dance Tango mystery quilt, as I am falling very behind. Step 1 is to make all the HSTs for the entire quilt. Carole, who wrote the mystery pattern, suggests making them as you go along, since you need them for the entire process, and not all at once. For the full size, I need 1,100 HSTs. I had hoped to finish them all in April. Alas, I am still 134 HSTs short. I did, however, finish step 2 of the Scrap Dance Tango, so I almost finished my April Goal. This is a blurry picture, but you can at least see them all here, sorted into groups of 10, with a total of 110 units. 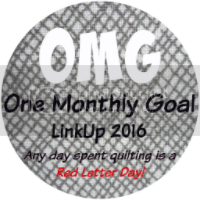 Even though I didn't quite finish, I'm linking up with Heidi at Red Letter Quilts for One Monthly Goal. April is Shauna's turn to be Queen Bee in my hive of the Stash Bee. Shauna is queen in two hives this month, so she put us all to work making the same block so she can make a quilt for her nephew. He picked the Tic Tac Toe block in purple, gray, & black. I love these colors together! Of course purple is my favorite, so I had a lot to choose from. Shauna asked for not too feminine, so I picked a kind of blocky geometric print that I really like for my block. It was a fun & simple block and I might use this one myself some day! I was really short on gray, so I couldn't make a second block, but I did cut some spare black and purple and sent it along with my completed block. Organizing scraps. It feels like a never-ending cycle, probably because as long as you are making new quilts, you are probably making new scraps. Several years ago, I picked up a library copy of Cut the Scraps, thinking I'd just look at the patterns. But I read the author's scrap method and it took over my thoughts for a few days, and eventually I decided that cutting scraps into usable sizes made a lot of sense. So I started with her sizes (5", 3.5", and 2" squares) and quickly added in 2.5" squares. I also cut 2.5" strips if I have WOF, and I'm about to add 2.5" x 4.5" rectangles to my sizes. I like having precut sizes ready to go, and I've used my squares for several projects, including blocks for hivemates in the Stash Bee. I had a small, 7 drawer stand came from a yard sale. It had a country floral design that was not to my taste. I painted it white, then used chalk board pain on the drawer faces. I've written in the size scrap for each drawer, and I can change it around to reflect what I have a lot of at any given time. The drawers are fairly small, but I like to use up my scraps, so that doesn't bother me. I also don't organize by color, as I know many do, mostly because I just don't have enough to warrant that storage method. I still keep my 2.5" strips in a plastic shoebox, but this move has freed up many of plastic containers, so I can use them for small projects instead. My current scrap project are 2 jelly-roll-race style quilts made using strip scraps given to me by my friend Snow. Both were pieced with purple sparkly "spacers" in between scraps. I have decided I don't really like the jelly roll race pattern for scraps, so hopefully these will be my last using this method, which is part of why I said earlier that I was about to start cutting 2.5" x 4.5" rectangles--I think that will create a nicer look from scraps of strips than the jelly roll race. One of these has just a bit of binding left to be hand sewn, and the other is layered but needs to be quilter. Linking up with Scraptastic Tuesday at She Can Quilt. I finished 3 projects during Quarter 1 of the Finish Along. This was not as well as I did last year. I actually made a lot of progress on a lot of the projects on my list, I just didn't finish very many. To make myself feel better, I've added progress from Q1 when it was on my Q1 list and progress was indeed made. In March, Amy of Diary of a Quilter had a giveaway of the new quilt kits by Itty Bitty Handmade and I was the lucky winner! I got my choice of their quilt kits and I picked the Rolling Hills kit. I have a coworker expecting baby girl in June and I picked the kit out with that baby in mind. My college roommate is expecting a baby in July. She's a marine biologist. She made the most awesome knitted fish mobile for Munchkin when he was born. Her baby quilt has to be fish. I recently saw some "crumb" fish that I loved and hope to model mine after those. I plan on using leftover bits of my I Spy fabrics. Progress in Q1: the top is now almost completely pieced. (Five hexie sides to go as of this writing.) I've been looking at binding methods for hexie quilts, since this one will not be on a background. I like the heart block that the February Queen in my bee picked so much that I made myself a few blocks and turned them into a mini. The top is done, but I need to finish it. Progress in Q1: This top is now 2 quilts. Both are layered. One is now quilted and at the binding stage. Progress in Q1: I'm using the Fat Quarter Shop's Jelly Roll Jam II tutorial, and I have the strips sorted into the needed sets. Progress in Q1: I cut the fire truck fabric into squares to alternate with the pieced blocks. The blocks are currently in rows but not yet assembled. I recently finished a quilt that wasn't a goal for anything or on my FAL list. It was donated to my local Project Linus chapter this week. The flag fabric was donated to Project Linus. I knew there wasn't much I could do with it cut up that was an improvement so I left it whole and just added red binding. It has straight line quilting in between the flags. I suspect this one will end up at Camp Corral, one of the many organizations that the Charlotte chapter gives blankets to. Camp Corral is for kids of wounded or fallen veterans and many of the donated patriotic blankets go to them. Not my most exciting finish, but I hope it is loved by a child nonetheless. I'm doing the Scrap Dance Tango mystery quilt run by Carole at From My Carolina Home. It started in January and I'm way behind. I'm doing the full size quilt, and I need 1,100 half square triangles. Right now, I have 666. (Number is completely a coincidence! I just cut a bunch and then sew them together, then repeat.) Cutting and making all the HSTs were step 1, and since then steps 2 & 3 have come out, with step 4 due out this coming Friday. And I'm still on step 1 making HSTs! So my One Monthly Goal, a lovely linkup run by Heidi at Red Letter Quilts, is to make some progress on Scrap Dance Tango. I will consider finishing all needed half square triangles and finishing all 110 units I need for Step 2 to be a successful completion of my goal. I'm not going to lie, I'd love to get farther than that, but those HSTs are time consuming, and I know April is a busy month at work, so I anticipate some evenings when I'll be too tired to sew. Here are the first dozen half square triangles I made. The only scraps I am eliminating are solids and batiks and scraps with not enough contrast to my background color, so it is a truly scrappy project. I've done a few more sine that first photo, here are some of the more recent HSTs.